Bike Week L.A. Cometh. 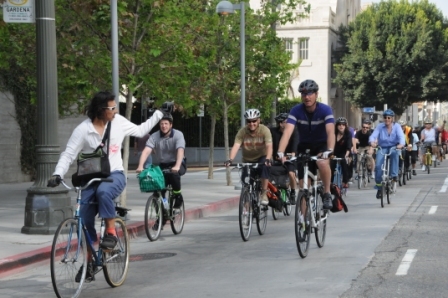 Cyclists ride downtown L.A. during previous Bike Week L.A.
Metro, in partnership with agencies and organizations throughout L.A. County, is sponsoring “Bike Week L.A.” this May 13-19. There’s a ton of cycling-related activities to get you on your bike next week. Here’s Metro’s news release. All Metro buses are equipped with front bike racks. Bikes may also be taken on Metro trains. On Bike to Work Day, Thursday, May 16, Metro will offer free rides to bicyclists on Metro buses and trains throughout Los Angeles County. Culver CityBus, Glendale Beeline, LADOT, Long Beach Transit, Montebello Bus Lines, Norwalk Transit, Pasadena ARTS, Santa Clarita Transit and Torrance Transit will also offer free transit rides to bicyclists who board with a bicycle or bicycle helmet. Big Blue Bus will offer free transit rides to bicyclists who board with a coupon and a bicycle or helmet. Metrolink will offer free transit rides to bicyclists who board with a bicycle. When is the MTA going to start being PRO-BUS RIDER, as opposed to “pro-bike rider, pro-Express Lanes Rider, pro-light-rail rider”? I have yet to see ANY promotion from the MTA of its BUS LINES in the form of MORE, OR LONGER (articulated!) buses on ANY of its bus lines!